koogrr IM'd me earlier today and reminded me that City of Heroes was shutting down tonight. Koogrr planned to be there, to hold a torch for CoH one last time. "I'll be on Virtue, in Atlas Park 33. 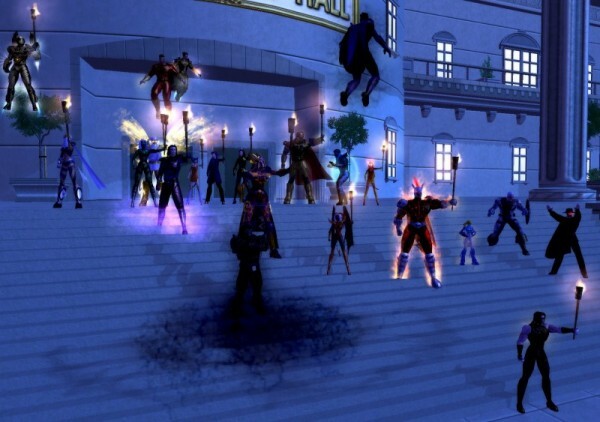 When NCSoft first announced they were shutting City of Heroes down, so many people logged into Virtue to protest that Atlas Park reached instance #33. They have kept that instance going ever since." Even in City of Heroes' heyday, it was extremely rare to see more than two instances of a zone; normally, there was only one. I canceled my account in January of this year, because the truth was that I had not played since October 2011. Even when the game went free-to-play, I didn't come back to look at it. Not even when they announced they were canceling it. But at 10PM tonight, I decided to go in. kagetsume was on too, so I chatted with him for a bit -- we haven't talked in ages. I couldn't get to Atlas Park 33 -- it was full -- so I went to Atlas Park 6. I didn't know where to go, so I flew up to the top of the globe that rests on the giant shoulders of Atlas's statue. There were three other people up there. One of them was DJing a tribute to CoH on Dimensional.Net, so I tuned in. His selection was broad, including instrumentals and a wide range of rock and eras. Almost all with a theme of heroes, rescuing, etc. Related to the theme. Lut suggested I get some screenshots, so I brought in different characters, my favorites from across several servers. Virtue kicked me several times and crashed once. The queue to log in at one point was over a thousand. I hadn't meant to stay to the end -- it's three hours past my usual bedtime -- but it's only 24 minutes away now, and oddly I am not sleepy. The music and taking screenshots, getting shots of Lut's characters, talking to people, has kept me up. I logged out Kasadya to bring on another character, Alice Bocor, to get screenshots of her. It's ten minutes to the end now, and I am in the queue to log Kasadya back in after getting kicked. I got back in, and got kicked again in less than a minute. Five minutes to go, and Virtue cannot bear up under the weight of its players' grief, the thousands who want to be there in the end. I am position 84 of 370 in the queue for Virtue, and it's 2AM CST, midnight Pacific: closing time. At 2:03AM, three minutes after the servers were set to go down, I reconnected with Kasadya. She rose into the air and broadcasted a triumphant "I'm still alive!" An instant later, the server went down for the last time. But you know, I cannot believe this is the end. Even if NCSoft never sells the game or resurrects it, when I think of all the bootleg WoW servers out there, I have to believe that somewhere, someone -- some hacker or dev who managed to sneak it out -- is running a CoH server. Paragon City is still out there, even if I can't visit it now. Farewell, City of Heroes. You were the best of the MMOs; I fear we will not see your like again. terrycloth and I talked jurann into re-activating his CoH account to play with us. While fooling around with a team of three not-very-well-suited-to-grouping-together characters, we talked about making new ones. The other day, I'd made a comment to Terry about a "rouge" in an Architect (ie, player-created) mission. "It makes me want to make a group where that's intentional. With Rouge and Foundation and Lipstick and stuff for names." So after I suggested "escaped research super-animals", Terry suggested we go with cosmetics-test animals. "They can be named for the cosmetics that were tested on them." Which all of us liked, so we went with that. After the requisite fiddling with the costume generator, Terry turned up as the Rouge Rat, a rat stalker in eye-searing red paisley ("Where did you get that outfit?" "I made it out of discarded test swabs for makeup"), I came on as Maskara (name stolen from Jurann), a little black bat corrupter using the sonic and pain sets (a rare instance where my character's powers sort of matched her theme), and Jurann as Eye Shadow, a polar bear brute. After Lut went to bed last night, I wasn't sleepy yet, so terrycloth and I decided to switch characters away from our Arachnos set (which the three of us are keeping at the same level) to some other pair. Me: "You wanted to play Pasture, right?" Me: "Okay. I'll bring on Alice." This was a purely pragmatic decision on my part. Pasture is 32, and Alice Bocor, at almost 26th, is the closest character I have to his level. Alice is the second character I made for City of Villains with an actual personality in mind. I'd seen a villain named "Daddy's Little Girl" running around, as a 4' toon with pigtails, and I thought "Playing a little girl sounds like fun." I wanted an angle to tie her to the CoH setting, so I thought I'd make her related to one of the NPCs in the game. Mr. Bocor is one of the first contacts that had stuck in my mind: he's an undead sorcerer of a sophisticated, well-spoken kind of evil. "I know! I'll make her Mr. Bocor's daughter! And she can be a zombie mastermind!" And that's Alice: a little blond kid with a ponytail and a white and pink schoolgirl outfit, who has undead playmates. That she adores. And calls by names like "Cuteypie" and "Spikeykins". She's sweet, friendly, guileless, and likes to rob banks and use her dead friends to beat "mean" people up. One of my favorite lines from her: "This is Captain Perfect! He's my best living friend EVER!" I had so much fun with her little-girl schtick that two of my heroes, Sugar Rush Girl and Jade Wind, are versions of the same concept played without the creepy twist. Still, it's the creepy twist that makes Alice work. She has a kind of child-like innocence to her: child-like in that her evil stems more from unawareness that she's doing wrong than from conscious intent. She feels guilty for not going to bed on time, but commanding undead abominations to kidnap people has no moral implications whatsoever. terrycloth's Pasture is a half-plant, half-goat humanoid, a vulgar, mammal-hating, hardened criminal who spent his formative years in jail The combination means that he says a lot of things that would be obscene except that he's using plant-based biological terms. The result is ... still sort of obscene, but in a way that's more startling and funny. Sample insult: "Pollinate THIS, insects!" Concept-wise, the two of them make a terrible combination. There's something horribly, horribly wrong about this little angelic-looking little kid whose worst slur is "you're MEAN!" running around with this 6'6" foul-mouthed green-furred satyr. Alice'd be shocked by his cursing if she could actually understand it. And there must be something horribly wrong with me, because I had a great time doing it. If it'd been a normal little kid paired with a typical demonic thug, I don't think it would have been half so funny. But the two characters have such bizarre twists that all conversations between them take on a surreal quality. Alice: "Hi! Do you like little girls?" Pasture: "What kind of question is that?" We were running around a mayhem mission destroying everything in sight, which is pretty fun in itself. Alice had her horde of six undead minions, and Pasture had a kind of walking Audrey-plant pet, plus rooted creeper vines he could summon, so there was lots of pet goodness going on. Alice: "Did you hear that? Your pet just made the cutest little noise!" Alice: "It made this little 'scrreeeawk!' sort of noise." Pasture: "Awww, I missed it." Alice: "Let's go break Shock Treatment out of jail. We need more minions." Alice: "There, now you have another pet to keep your plant company. You should always have two pets so they won't get lonely when you're not around." We didn't do fireworks this year. We used to go to a 3rd of July party and shoot off fireworks, but the woman who hosted it moved to somewhere less conducive to explosives and we haven't really done anything to celebrate the 4th since. I was rather undermotivated in general this weekend, with the result that I spent a lot of time playing City of Heroes and even more time dinking around in City of Heroes. "Dinking around", in this case, means mostly playing with the auction house. I've described arbitraging* in City of Heroes before. Several -- well, almost all of my characters over 20th, actually -- of my characters are moderately wealthy from arbitraging. This weekend, I took my ill-gotten gains and went shopping. Apart from gaming, I did a few other things. Lut and I went out to eat a few times and accumulated more leftovers for our fridge koogrr called a couple of times and we talked for a while, which was fun. I also called telnar and minor_architect and had nice chats with them. I worked on coloring a pin-up-style picture I'd drawn, because apparently pin-ups are what I draw even though I don't especially like them. Funny how that works. I think it's because pin-ups were my favorite style from age 12 to 25 or so, and that's when I got the vast majority of my art practice. Now I do them because I'd rather be adequate in drawing a style I don't particularly care about than bad at a style I have more interest in. Also, drawing doesn't interest me now the way it did when I was younger. What artistic talent I possess is really wasted on me. I wonder if my siblings ever feel this way about the years they spent practicing the violin and the piano? Anyway, I still feel a little productive for having done something in the way of art, so I'm grateful for that. In other news, my brain is trying to make me miserable, with some assistance from my job. I wish one of the two would quit it. Preferably my brain. You know how you'll have a cat that's trying to get at something it shouldn't, so you yell "no!" and the cat goes away? And then two minutes later the cat's back at it and you have to yell again? That's my brain. I keep telling it to stop and it works for two minutes then it's doing it again. Stupid brain. Obviously I need to put the misery in a locked cabinet where my brain can't get to it. * I have this urge to write an article explaining the difference between arbitrage, speculation, and investing. I don't know why. City of Heroes/Villains has a space in the character generation process for you to write a blurb about your character. Somehow, I almost never manage to use this space. Fairly often, I don't even have background ideas for my characters. My character-creation process goes "okay, this costume looks cool, I'll start beating stuff up now". But I'm trying to be a little more creative and personable with my CoH avatars. To that end, I actually wrote up blurbs for a couple of them, which I will share here in honor of Pixel-Stained Techno-Peasant Wretch Day (or something). They're kind of long for CoH blurbs but still better than nothing, I think. Li'l Terror is a villain and Jade Winds is a hero. Jade Winds's blurb is subject to change if Six Demon Bag ( ltwarhound) or Foo Fires ( terrycloth would prefer something different. Lily loved the darkness more than life itself. So when her forays into dark magic killed her, she couldn't exactly complain. Mostly because she was dead. But even in death the darkness did not forget Lily. It had destroyed her once but wanted her still, and would not give her up. From the tiny bodies of rats and roaches and other things that thrive without light, the darkness formed a strange new shape in the memory of its lost love. Darkness imbued its creation with what it understood of Lily's personality. It sought to put Lily's soul into this new body. But souls are beyond the reach of darkness -- aren't they? The new being was born a tabula rasa, without knowledge of where she came from or what she was. With darkness as servant, guardian, mother, and perhaps lover, she grew quickly in the shadows of the Rogue Isles: a little terror preying on the fears and weaknesses of the human and inhuman monsters of the world around her. Jade Winds is the daughter of a Tsoo sorcerer and a woman of the Fair Folk that the Tsoo had captured whose power they hope to tap for their own line. While Jade was still an infant, her mother escaped with her from their Tsoo captors. Jade grew to adolescence among the Fey, but her half-human ancestry meant she never fit in among them. And the The Tsoo did not forget her. Once every year, on All Hallow's Eve, the Fey lands come into contact with the mortal realm. When Jade was thirteen, she ventured back to the mortal realm on Halloween, and her father's magic instantly located her. He tricked her into coming back with him to live among the Tsoo, rather than returning to Faerie. Already she showed great aptitude and the Tsoo had many plans for ways to use her growing powers. For some months she believed the lies and promises the Tsoo told her. But even so, Jade Winds missed her mother and her friends among the Fair Folk. When the next Halloween neared, she asked her father to let her visit them. He refused. When she tried to leave on her own, the Tsoo imprisoned her. Miserable and angry and afraid, Jade Winds remained a captive until her rescue by a Celestial canine called Foo Fires and a renegade Tsoo who goes by Six Demon Bag. Halloween is long passed and she cannot return to Faerie now. Instead, she studies under Six Demon Bag's tutelage and fights against evil and tyranny with her new companions, hoping someday to be worthy of the help and friendship they've shown her. I'm in a good mood today, despite being short on sleep. Last Saturday, Lut, terrycloth and I levelled our supervillains on Virtue to 50th, so we'd be able to play the new villain epic archetypes when issue 12 comes out. I don't think there was any big rush on this -- last I saw issue 12 hadn't even gone live on the test server yet. But we pushed a bit for it anyway. I was a little melancholy about Untainted (my highest level villain) hitting 50th, actually. In Warcraft everyone's always excited to reach the level cap, because there's all this stuff to do in the game that you can't do until you reach the level cap. The endgame is all about raiding and getting phat lewt and whatnot. But City of Heroes really doesn't have much content for heroes and villains who are at the level cap. Which I like, because I don't enjoy raiding or getting phat lewt very much. There is some stuff -- taskforces and strikeforces and fighting giant monsters and whatnot -- but not things most people want to do over and over and over again. Not the way WoW guilds will have 20-man raids on Karazhan every night for 5 hours. No, in City of Heroes mostly what people do after hitting 50 is play new characters. So the three of us started talking about making up new characters, since our existing stables of 15+ each spread across two or more servers were clearly insufficient*. * It's the costume generator, I think. CoH lets you have 12 characters on each server and it's still not enough. Foo Fires (Terrycloth): Maybe I should try again. I don't really think this character fits with the two of yours. Jade Winds (Me): No, it works. I'm the plucky kid, you're the animal mascot, and Six Demon Bag (Lut) is our grumpy mentor. Jade Winds: Did one of you get a little careless? Foo Fires: What? No no, I didn't burn *this* building down. Hellion Gang Member (NPC): Look out, it's Foo Fires! Get him! Six Demon Bag: The building's on fire, and they know Foo by name. Six Demon Bag: One should always be suspicious of coincidences. Jade Winds: Six also uses fire magic. And he knows Foo as well. Six Demon Bag: And well you should be. Six Demon Bag: Er, I mean: pay no attention to that. The characters made it to 7th level, just barely, before we logged for the evening. I convinced Lut to stay up long enough to do a bank mission and get temp travel powers, because those make life a lot easier. One of the quirks of starting the new crew on Justice is that none of us had any characters on the server. So there were no level 50s around to drop a couple million influence on us for petty cash. This doesn't bother me. In fact, I'm actually happy about it, as I get to see how long it takes me to amass wealth starting from zero. You don't really start from zero in CoH, as it happens. The tutorial zone supplies you with two third-tier inspirations, and these sell for 10-50,000 on the auction house. (Except during the Halloween events, when the market for them crashes because the game hands them out like candy during it. Literally.) 25,000 is more than enough to get anything a new character's little heart desires from NPC vendors in the game. And it's not like EQ: the NPC vendors sell everything a PC needs to be competent. Still, there's some nice things that one can only get from other PCs via the inflated prices of the auction house. And since I enjoy fiddling with the market to make money, I'm doing it here. So Lut and I pooled our cash and he handed me his third-tier inspirations and I set to work. I guesstimated that I could get to a million influence before 12th level. This is going to be even easier than I thought, due to our preference for battling only magic-based villains. Magic-based villains, especially as you get higher in level, get rarer and are also more difficult to fight than tech-based varieties. As a result, the salvage that drops from them is correspondingly a lot more valuable. Also, even the salvage that new characters get is still in use by the highest levels (ie, the ones with the most cash to spend). My other characters all hoard their magic salvage in their vaults against the day that they'll need it. But since these new ones needed money before they were going to be making anything, this morning Jade Winds sold off everything she'd accumulated the night before, most of it priced to move. Between that and selling the four inspirations, I had almost a quarter of a million to start arbitraging with. Arbitraging with lowbies is kind of a pain, because your character's inventory space expands as you level and when you're 7th you don't have very much. But we were in King's Row, where the market is close to an NPC vendor, so it wasn't horrible. Jade bought and sold eight or so recipes in a hurry this morning, and made, I'd guess, around 100k in profit from it. I left a bunch of bids up before I logged out this morning, so probably this evening she'll be able to make considerably more. One of the things that makes this interesting for me is that in EQ, there used to be hordes of lowbies mobbing high traffic spots and begging for money. I don't see that in CoH, and I think that the ease with which lowbies can raise cash from the market is a big part of that. In some sense, the lowbies are getting charity from the rich, but it's instutionalized instead of individual. Another example of charity: you can get badges for making invention-origin enhancements. This is mainly a hobby for the rich, as making IOs is costly. But IOs can olny be sold to other PCs. So most of the IO enhancements that get made for badges are auctioned off, and many of them sell for rock-bottom prices -- far, far less than the cost of their components. I scooped up several of the less popular ones cheaply for Jade. Alas, I'm not likely to play Jade Winds much for the next several days. Lut has a raid in WoW tonight and tomorrow night I'm flying to Florida. So tonight I'll pack for the trip when I get home, and then play some other character in CoH or CoV afterwards. I am modestly failing at NaNoWriMo, which is an unexpected outcome for me. Two weeks in, and I'm running about 7000 words short. My outline is pretty trashed, but I'd estimate I'm about 15% through it. I'd expected to be somewhere else at this point. I thought I would either be right on the edge of succeeding, word-count-wise, or that I would have given up. Instead, I'm like the last sailor on a sinking ship, still bailing with a leaky bucket. The ship is going to go down, there's no question of that. But I'm still here. Last night I spent 45 minutes finishing a post and put it up at 9:15PM, then went off to play City of Villians. I played for about two hours, mostly with koogrr, ltwarhound, and terrycloth. As we were running "one last quick mission" to level Little Critter (Terrycloth's stalker), kagetsume and boingdragon logged in their villains and joined us. I don't feel like playing games with my friends is keeping me from getting the NanoNovel done on time. I feel like it's keeping me from giving up on the project entirely. And probably neither one is true, but I do know that when I finished that post last night I was in a pretty crummy mood. Spending two hours hanging out with people I love and playing a good game cheered me up immensely, as I'm sure Lut can attest. It's one of those things that I'm not only glad to be doing, but glad to have done, too. I was sorry to leave after the last mission, especially since I'd gotten to spend so little time playing with Kage and Boing. (Also, a six-player team composed entirely of my friends is a very rare thing for me and big teams are a whole lot of fun in City of *.) But it was late and I have to be at work early on Wednesdays.